Shop Levys M4 3.5 Inch Leather Bass Strap from AMS and enjoy Fast & Free Shipping. The extra width of the Levy’s M4 Leather Bass Guitar Strap is specifically designed to distribute the weight of a bass or any other heavy guitar. 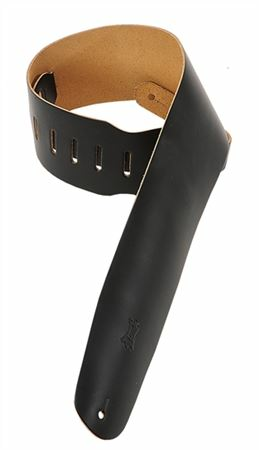 The bass guitar strap is 3 ½ inches wide and is adjustable from 36 to 52 inches. This is a basic wide strap very well suited for use with my Music Man bass. Thank you Dan for a spot on recommendation. I love the design. Wonderfully made.I am enjoying it. No nonsense wide leather strap, fits tightly over buttons. Looks good. Pretty stiff leather. Overall a good strap, nice and wide. I just wish the weather was a little thicker. This strap feels very comfortable. Easily protects shoulders and necks against the weight of solid body guitars. Protection at its finest. lacks padding to make it comfortable. Does spread the weight around quite well. Only 4 stars due to being thin but what do you expect for a 20 dollar bass strap. This strap is really wide which makes it very comfortable when uesed with my bass guitar. I would have given it 5 stars except that I think the leather is a little thin, and I wonder how it will hold up. Only time will tell.